Elaine Estrada is a young business owner in the San Luis Obispo area, she is a certified massage therapist and has a dedicated clientele throughout the area. After recently moving locations she decided it was time for a new logo before she sends out new promotional material. Elaine wanted an updated logo for her spa. 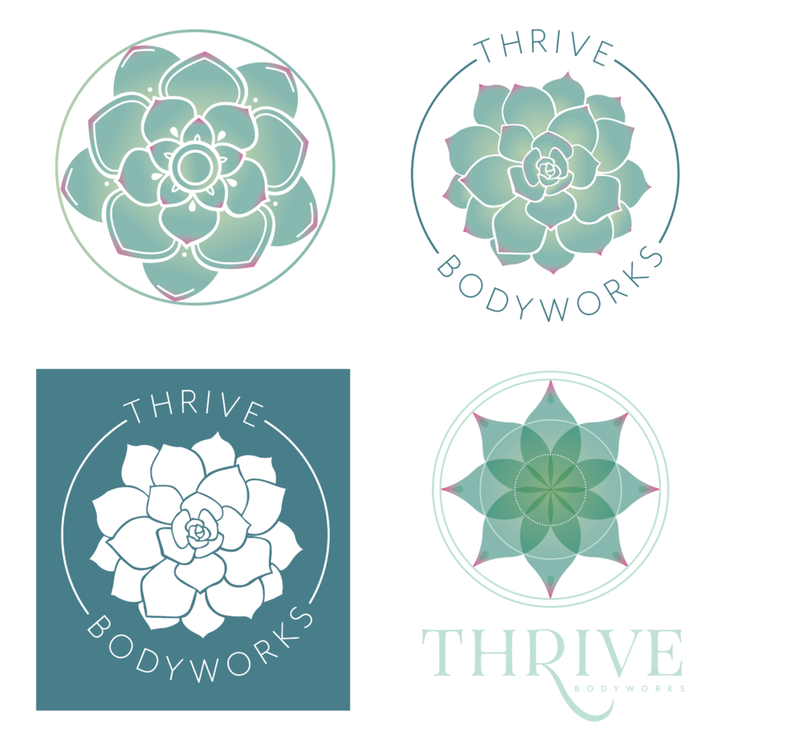 Her original logo was a succulent and she wanted to keep the same icon while adding a modernized twist to it. With a cool color palette being the typical scheme for spas, she also wanted to add a splash of color to make her brand more recognizable. For her new location she wanted to start fresh with new print materials to hand out to past and potential client. I met with my client over coffee to discuss where she saw her brand going. Together we jotted down key points and illustrations of what she envisioned for her logo, as well as what print materials she wanted to develop for her marketing efforts. Elaines reasoning for the succulent is that her office location contains a lot of live succulents to capture a raw connection with nature in her space. She wanted that connection to carry through to her branding and become a symbol of her massage therapy practice. Additionally, she wanted to add a unique flare to the succulent by adding a splash of colors to the tips. After the initial meeting with my client, I started to rapidly whip out rough versions of a potential logo. I included more abstract impressions of a succulent through a mandala design, as well as various line drawings from a side view. I created the initial color scheme at the bottom as a base to build and adjust from. For this round of drafts the succulent contained a larger amount of color, as well as being distinctly more 3D than the first round options. Additionally I wanted to get my clients input on typography so that we could begin to narrow down the selection. After this round of drafts it seemed as though she gravitated towards a clean and simple Sans Serif. After receiving some more client feedback I began sketching and creating some more rough drafts to present to my client. I included more detailed/realistic succulents as well as some more abstract impressions of a succulent. Additionally this round of versions contained more subtle hints of the pink pop. My client had also gravitated towards the more rounded logo drafts that I had presented to her so I kept these versions in a more circular container. After discussing back and fourth, Elaine decided that the bottom right succulent was the style she wanted to move forward with. Some changes that were made for the final logo was a slight color palette adjustment as well as some typography changes. For the vertical logo the succulent was sliced in half and placed it over the title. I made the ‘THRIVE’ text a bold Sans Serif and spanned the full width of the succulent, as well as reduced the bodyworks size and spacing. For the horizontal logo we utilized the same typography as the vertical, and completed the full succulent to the side. I’ve included below the final color scheme as well, it consisted of shades of sea-foam green as well as a magenta to be used sparingly as a pop of color.